- Discrete Use discrete collision detection against all other Colliders in the Scene. Other colliders will use discrete collision detection when testing for collision against it. Used for normal collisions (This is the default value). - Continuous Dynamic Use sweep-based continuous collision detection against GameOjects set to Continuous and Continuous Dynamic collision. It will also use continuous collision detection against static Colliders (without a Rigidbody). For all other colliders, it uses discrete collision detection. Used for fast moving objects. - Continuous Speculative Use speculative continuous collision detection against Rigidbodies and Colliders. 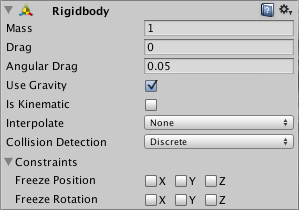 This is also the only CCD mode that you can set kinematic bodies. This method tends to be less expensive than sweep-based continuous collision detection. Compound Colliders are combinations of primitive Colliders, collectively acting as a single Rigidbody. They come in handy when you have a model that would be too complex or costly in terms of performance to simulate exactly, and want to simulate the collision of the shape in an optimal way using simple approximations. To create a Compound Collider, create child objects of your colliding object, then add a Collider component to each child object. This allows you to position, rotate, and scale each Collider easily and independently of one another. You can build your compound collider out of a number of primitive colliders and/or convex mesh colliders. Note: Compound colliders return individual callbacks for each collider collision pair when using Collision Callbacks.